Sumatra Mandheling Grade One coffees are considered the world's most full-bodied coffees. 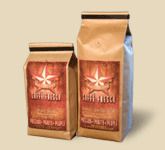 Caffe Fresco SCR's Sumatra Mandheling cup has herbal and earthy aromas and a heavy, almost syrupy body. UTZ means "good" in a Mayan language. UTZ CERTIFIED is a worldwide certification program that sets the standard for responsible coffee production and sourcing. Our independent seal of approval ensures that goods were produced in compliance with strict guidelines protecting the environment, wildlife, and communities. Bird Friendly refers to organic certified coffee grown on farms with a shade cover that provides substantial habitat for migratory and resident birds. The Fair Trade Certified label is the consumer guarantee that farmers are getting a fair deal for their products. The National Organic Program accredits the certifying agentswho inspect organic operations to certify that they meet USDA standards.